German Salazar has found some innovative and smartly-engineered new cleaning accessories that can benefit any shooter who wants to maintain the accuracy of his precious (and expensive) barrels. Here’s German’s report on the new Bore Rider Jags and Bore Rider Brush Guides. We see new bore cleaning solvents introduced with some regularity, but cleaning hardware evolves more slowly. I’ve been using some new jags from Don Leidich’s Bore Rider Barrel Care Products for a few months and am satisfied that they are a genuine improvement over anything else I’ve used. Don began making these items for the black powder cartridge shooters as their cleaning needs are serious and frequent. He has now expanded the line to include popular bore sizes for modern centerfire barrels. Don’s Bore Rider enterprise makes jags as well as companion Brush Guides for use with bore brushes. These are all made from Acetron® GP, an acetal polymer material similar to Delrin, but with greater lubricity. 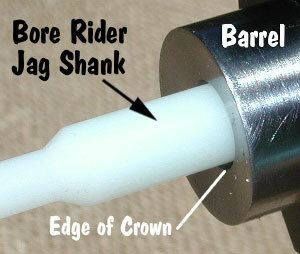 Bore Rider Jags and Brush Guides minimize any damage that might occur to the crown when the jag or brush exits the bore. 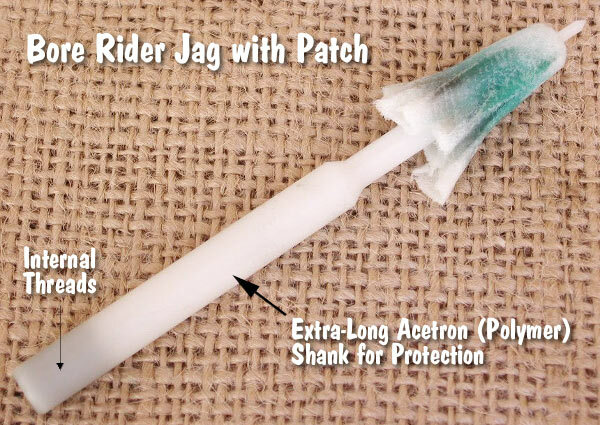 With conventional jags and brushes, when brushing or patching your barrel, the cleaning rod shaft falls to the bottom of the bore as the patch or brush exits. Over time, that can result in excessive wear at the lower edge of the bore (6 O’Clock position) in the last few millimeters on the muzzle end. In extreme cases you can even wear a slight groove in the lip of the crown (i.e. the very end of the rifling at the muzzle). Another advantage of Bore Rider Jags over conventional brass jags is that you don’t get “false positive” green/blue patch colorations from solvent reactions with the metal jag itself (as opposed to actual copper fouling in the barrel). If protecting your barrel’s crown was all that these items did, that would be enough to merit their use. However, what’s more interesting about the jags is that they are made for a very tight fit in the bore and as a result, they truly get the patch working to scavenge the grooves of all the residue possible. The fit is so tight that Don was concerned that not all patches might work properly, as some extra thick ones might not enter the bore at all on this jag. I’ve used the jags with patches from Sinclair, Bruno’s Pro-Shot and a couple of no-name bags and all have worked flawlessly. Also, the jags are designed so that the segments that hold the patch material can never come in contact with the crown while pulling it back into the barrel. My borescope examination of the barrels shows that the job is getting done right. The .223, .243, .264 and .308-caliber jags sell for $15.00 and the Brush Guides sell for $13.00. Other caliber jags start at $22.00 for jags and $18.00 for Brush Guides. These are threaded and chamfered to fit appropriate Dewey rods. The opposite ends on the brush guides have 8-32 female threads. Customers can buy adapters (from other vendors) to fit other brands of cleaning rods. Don can also customize Jags to fit a customer’s rod specifications if you don’t want to deal with an adapter. Don’s custom made Jags and Brush Guides cost $25 and $18 respectively. Share the post "Protect Your Barrels with New Polymer Jags and Brush Guides"
This seems like a really good idea. With a bit of thought it also seems like most (but not all) of the benefits could be had with a bit of heat shrink tubing of appropriate size – and sure enough – it works. No data on how the HST resists bore solvents yet, but since most of it is either PVC or silicone, it ought to be fine. Don’s prices have changed slightly since this article was first posted. 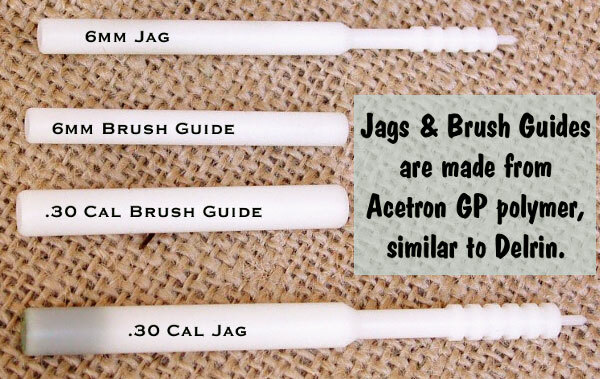 I recently ordered two jag and brush guide sets from him and look forward to getting ‘em. EDITOR: John, thanks for noting the price change. We’ve updated the prices listed in the story and placed a link to Don’s website.